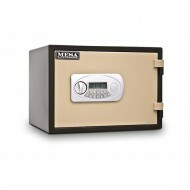 MESA's MF30E is a small one hour UL rated fire safe. UL has rated this safe to protect contents for one hour. 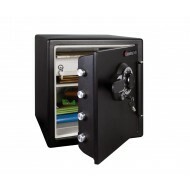 The electronic lock on this safe is easy to program and easy to access. It operates on batteries which can be changed from the outside. An override key is also provided. 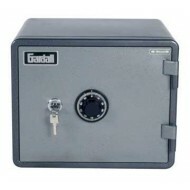 This is well built safe with solid steel heavy deadbolts and live bots. In addition, the hinges are extra heavy duty to prevent break in. The interior includes an adjustable shelf and lock door. In addition, the MF30E has an impact rating. The door did not break open when the safe was dropped 30 ft. 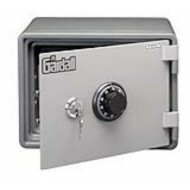 Please note as of this writing we still have some brown safes in stock, but unless you tell us by phone, we will ship the safe in the main image (which is gunmetal gray). This is a solidly built UL rated one hour fire safe. The MF50E is rated by UL to protect contents for one hour in a fire by keeping the interior temperature at 350F or less. The test exposed this model to 1825F heat. 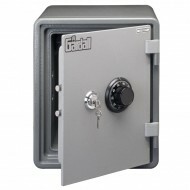 The MF50E is equippted with an electronic lock which is easy to program and access. While the batteries can be changed from the exterior however just in case an override key is provided. This model MF50E also passed an impact test. When dropped 30 feet the door did not break open. 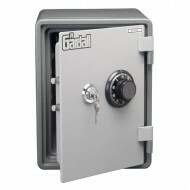 The MF Series comes with massive live-locking bolts and deadbolts that impel deep into the body of the safe. The solid steel bolts prevent the door from being removed if a thief attempts to pry it open. Heavy-duty hinges provide fur ther defense and efficient operation of the door. 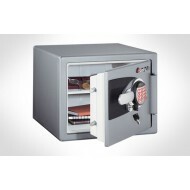 Each safe can be anchored to the floor for added security.